Takayama Nohi Bus Center is located next to JR Takayama station. Route bus tickets around Takayama and Express bus tickets are available at Ticket Office in Takayama Nohi Bus Center. JR Takayama-Line 「Limited Express Wide-View Hida」 is suspended until further notice due to heavy rain last month . Because of this reason,our Express Bus「Nagoya-Takayama Line」is very crowded and it's difficult to make a reservation now. We have detour route「Gifu-Takayama Line」from Meitetsu Gifu station or a connected route 「Limited Express Wide-View Shinano」and Express bus「Matsumoto-Takayama Line」. For details,please refer to the follwing link. 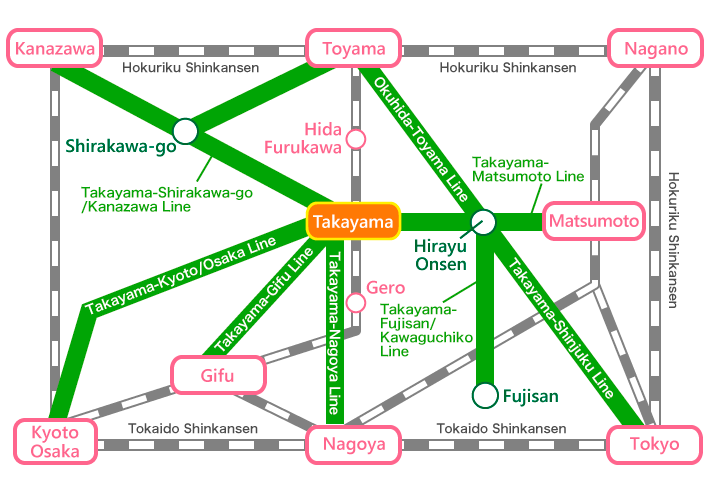 How to get to Takayama from Chubu Centrair International Airport. Information for the Chubu Centrair International Airport ~Takayama Bus Service. Please take the Meitetsu train line from Chubu Centrair International Airport to Gifu Station, then transfer to the bus bound for Takayama. For a detailed schedule please see below. Information for the Chubu Centrair International Airport->Takayama Bus Service. Please take the Meitetsu Bus line from Chubu Centrair International Airport to Nagoya Station, then transfer to the bus bound for Takayama. The Airport Bus is accessible only from the Access Plaza. Please follow the signs out of the arrival lobby to the Access Plaza. The Bus bound for Takayama leaves from terminal 7 on the 3rd level of the Meitetsu Bus Center. The Bus bound for Chubu Centrair International Airport leaves 5 on the 3rd level of the Meitetsu Bus Center.